Nicole Richie and beau Joel Madden were spotted on the weekend (2nd January) at 8 Oz. Burger Bar in West Hollywood. Nicole Richie was looking very fashion forward wearing a pair of round white Chanel shades. Nicole Richie was wrapped up in a black coat with black opaque tights. Nicole Richie accesorised the outfit with my favourite Louboutin's the classic Mary-Janes and carried her loved Balenciaga city bag. The white Chanel sunglasses really add a contrast to the black outfit, but i must admit only Nicole Richie could work those shades! 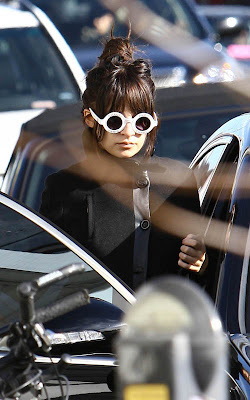 i love the new trend towards round sunglasses and i also love chanel, but i don't really like this particular style in white, it looks a bit dorky. In black or tortoise shell it may have look better. But regardless, nicole can pull off the white ones. why the rest of people are wearing t-shirts and Nicole wears coat? i really dont like those glasses in white, in black they would be great, but still on nicole, she can pull anything off i think.